Mad Men season 7 reviewed: Did everything have to end quite so neatly? Did everything have to end quite so neatly? 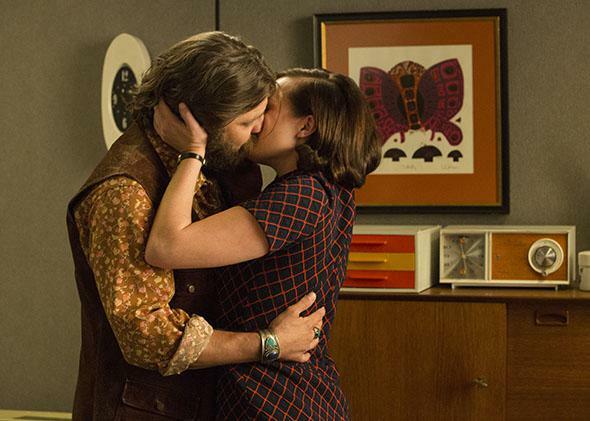 Jay R. Ferguson as Stan Rizzo and Elisabeth Moss as Peggy Olson in Mad Men. Read the rest of Slate’s Mad Men coverage. Complaining about a series finale, especially of a series that has been as consistently excellent as Mad Men, seems churlish to me, like not thanking your dinner host because you found the strawberry shortcake too sweet. So I apologize in advance to Matthew Weiner for handing him a prickly succulent on my way out the door. But I did not much enjoy this episode. I feel like somebody just gave me some mildly bad news. Julia, you pointed out last week that the Mad Men writers had pulled off a nifty trick: In the two episodes that preceded the finale, they’d given nearly all of the main characters a valedictory turn, leaving the finale free to strike out in some unexpected direction. Each of the main characters was poised for some new future: Pete was jetting off to Wichita; Peggy was strutting down the halls of McCann; Joan took a stand, and the cash; Roger found a mate his age, Don was blissfully On the Road. None of these futures seemed a sure thing—in fact, you could argue that the majority seemed unlikely to pan out. But they all vibrated with potential, inspiring the viewer to imagine what the next adventure might hold. Then along comes the finale, a 75-minute exercise in bow tying. Mad Men has rarely been sentimental, even when it comes to its heroes, but last night everyone got their exciting new job, their longed-for loved one, or, in the case of Pete, both. I don’t mean to suggest that I wished ill on any of these characters, not even Pete. But I preferred the sense of possibility, and precariousness, that each character brought into this episode to the sense of dreams delivered with which they left it. Hanna, I’m with you: The moment Peggy and Stan shared on the phone two weeks ago, happy simply in the knowledge that the other is on the line, was far more powerful than the confessions and clutch of the finale. There was a Ross-and-Rachelness to last night’s proceedings, right down to Stan’s breathless Schwimmering up to Peggy’s office to close the deal. As for Don, I assume, as you do, Julia, that we are meant to understand that he is the creator of the “It’s the Real Thing” ad. That’s actually a pretty charitable ending for him. Sure, he hasn’t come very far, but he seems to have internalized Peggy’s pep talk, and accepted that Don Draper has amounted to something. That something isn’t a great dad or faithful husband. But he is a damn good ad man, the kind who goes out into the world, puts a finger in the wind, and comes back with campaigns that don’t just reflect the culture, but shift it. (As Jeff Chang pointed out in a Slate piece this morning, two different versions of the Coke jingle ended up on the Billboard charts.) If we believe Don is the author of that ad, it suggests that he’s gone back to being something like the man we met in Season 1, who took pride in his vocation, even if he perhaps recognized that his work, like his life, was frequently a lie. At the Slate offices last week, we had fun revisiting the now-classic Season 1 scene in which Don sells Kodak on his nostalgia-soaked campaign for the Carousel, in which he used snapshots from what seemed like his blissful family life to sell the executives on his concept. Watching that scene again, I was struck by how genuinely great the pitch was, and it made me realize how long it’s been since we’ve seen Don work his magic as a creative director. When was the last time Don came to a meeting with a great, or even good, idea? For a while now, this has been a series about an ad man who doesn’t think much of advertising, and frankly doesn’t seem very good at it. This morning, I went back and watched Don’s Hershey’s pitch, from the end of Season 6, in which he attempts to sell the client another idea steeped in nostalgia, this time spinning a tale about how his father used to buy him chocolate bars when he was a boy. The client is duly mesmerized, but Don can’t sustain the fiction. As Roger tries to ink the deal, Don breaks down and describes his real childhood, in a brothel, noting that the only affection he ever received was from a girl who paid him to go through the pockets of johns while she had them otherwise engaged. (Don comes by his suspicion of prostitutes honestly.) The scene is startling to watch: It suggests not just that Don had lost his touch, but that the very idea of the work had become horrible to him. Viewed this way, this ostensibly cheery finale might actually be every bit as dark as that of the Sopranos, with its nihilistic cut to black: A vision of America sold a beautiful lie about itself by a man who broke his vows, scandalized his child, assumed another man’s identity—and then did yoga for a few days and now feels better enough about it all to continue to enrich himself, his company, and his clients by peddling whatever product lands on his desk. It’s an America we’re still living in, by the way. Coke currently has an ad in frequent rotation in which the beverage—in a throwback hobble-skirt bottle—becomes a symbol of good will toward men, handed from person-in-need to person-in-need as 1969’s “Put a Little Love in Your Heart” plays in the background: There’s no problem we can’t solve if we’re all willing to give each other the occasional soft drink. Look what you hath wrought, Don Draper! I started out complaining that this episode was too saccharine, and ended up suggesting it was too bitter. Which is it? Both, I guess. In the penultimate episode, the balance of hopefulness and despair, promise and peril, was painstakingly calibrated; last night, there was a shake in the handling that got hairy at high speeds. It made me wish the series had ended one week earlier. That said—let’s have a bit more TV Club, shall we? Julia, you heroically (and brilliantly) dissected last night’s episode in the wee hours of the morning, but that left you precious little time to weigh in on the sweep of the series. Now that Mad Men has concluded, where do you think it stands among the great dramatic series of the past decade? And what, in the end, was the series about?